We just know how much you'll enjoy your Snowmass Village vacation condo or vacation home, and we're always available to answer questions. Please call us anytime. We look forward to seeing you. Check in at the Mighty Mouse Management Office anytime you arrive for your stay. Offices are located at 15 Kearns Rd. in Snowmass Village. If you are checking in after hours, your welcome package will be outside the office door. Dependent upon property, listed individually. Check in at anytime after 4pm and check out by 10am. Need a different time? Call a day or two in advance. We'll see what we can do. What is supplied with my vacation condo or home? Our vacation condos and homes are fully equipped. If you have special needs, pleaee call ahead 2 days. All your necessities to feel at home are provided. Don't forget your toothbrush and swimsuit. 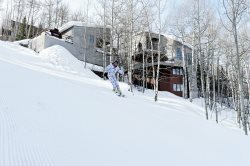 Snowmass Village is a vacation place for every season, winter, spring, summer and fall. In the winter it is best to plan for extreme winter conditions whereas the summers are warm but cooler in the evenings. There are many activities for each season to plan for such as hiking in the summer and skiing in the winter. Yes, for an extra charge. Have your condo cleaned as often as you like during your extended stay.